Hi VEG and VEG'S dad! This is a picture of Benjamin's supper this evening. 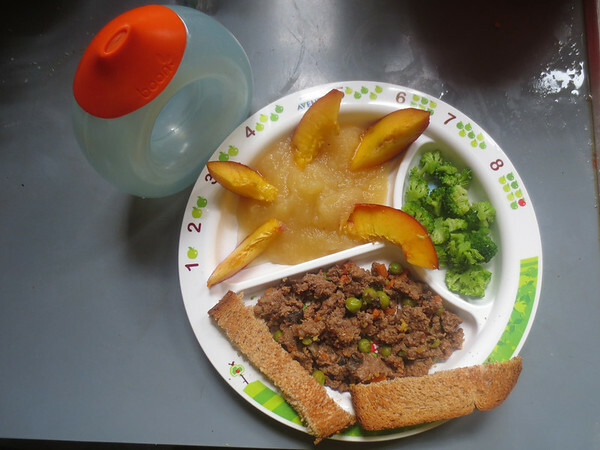 He is having ground beef with veggies (carrots, peas and mushrooms) and toast sticks, steamed broccoli, apple sauce with nectarine, and a sippy cup of water. He's 14 months old, but I think he could eat all of the dinner you get during the school year because he has 16 teeth already! Hello Benjamin, That looks a really good dinner and again I see broccoli, peas and soldiers (great for dipping in a boiled egg). Is the apple sauce homemade, I only ask as some of the packaged apple sauce in the UK is gross. Not that I eat it. I find it really great when young children remove the food from their mouths, examine it and then put it back. It seems like they are associating the taste with the look and the colour. And if they don't like and you hide it next time, they find it. Great post and Thank you!! My guess about the applesauce is texture (will he eat a sliced apple? ), when I was a child I was turned off of some foods because of the texture. An example would be cheese, I loved it melted but couldn't eat it in it's natural state. But I love all cheese now melted or not. 'They' say you are what you eat, so I must be a hunk of cheese! With my dad, it was tinned tomato soup. Nice that Benjamin likes broccoli then, since that is also a good source of iron. If Benjamin likes fresh orange juice, you could try that as the drink instead - vitamin C increases the amount of iron the body absorbs. When my two girls were little, I would squeeze a couple of oranges (sieve out the 'bits'!) and dilute with a little water - they loved it!